While Guillermo del Toro is currently in some phase of production with the TV pilot for The Strain, the vampire trilogy he co-wrote with Chuck Hogan, the great director is having an otherwise busy month with both the Blu-ray/DVD release of Pacific Rim hitting stores this week and the upcoming coffee table extravaganza Cabinet of Curiosities: My Notebooks, Collections, and Other Obsessions. As such, he’s come out of his memorabilia-laden belfry to talk a little more about some of his future projects that may never actually see the light of day, namely Pacific Rim 2 and his interpretation of Frankenstein. While genre fans’ expectations for Pacific Rim were dashed by its U.S. box office, it’s still a worldwide hit and the most successful non-animated original property of the year. One might think that make its sequel inevitable, and del Toro points out that, regardless of how successful the home release is, the sequel is definitely getting written. Pacific Rim was one of my favorite films of the summer. The movie was a blast, that rare cinematic outing that knows exactly what it wants to be and then puts every last ounce of energy and gusto into being that thing in the very best way possible. 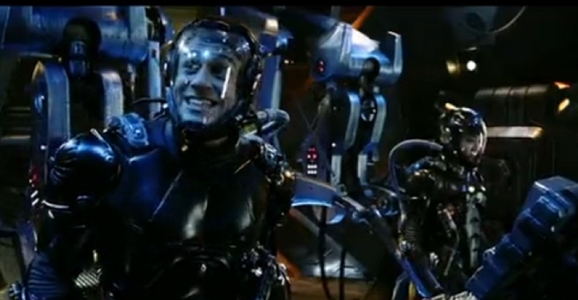 Pacific Rim is like eight-year-old Guillermo del Toro and Travis Beacham invited us over to their house to play robots vs. monsters, but their parents gave them a $200 million “afternoon fun” budget. That should put a giddy little smile on your face, and as I’ve often said, if you can’t find joy in giant robots punching giant monsters, then you, my friend, are already dead. Pacific Rim is, succinctly, a blast. If you didn’t check Pacific Rim out in theaters, it hits Blu-ray, DVD, and digital formats today. In addition to the movie itself being a damn good time, the combo packs include an audio commentary with del Toro, a ton of behind-the-scenes featurettes, deleted scenes, and a blooper reel (you can actually see some of that right here). Hell, the collector’s edition even comes with a replica of Gipsy Danger’s the Jaeger piloted by Raleigh Becket (Charlie Hunnam) and Make Mori (Rinko Kikuchi). Sadly, it’s not life-sized and functional, but that’s what you people get for not going to see it on opening weekend and driving up the box office. I did and they gave me mine, but then the police confiscated it after I tried to pilot it solo and flattened a neighborhood birthday party. Bring on the rocket punches! As you might expect, there is a lot of Charlie Day seen here, as he is the obvious comic relief both in the film and in his normal TV gig on FXX’s It’s Always Sunny in Philadelphia, one of the greatest series of all time. And though he isn’t sniffing glue or acting as if he can’t read or write, Day is still good for some chuckles here, and we can see just how much freedom director Guillermo del Toro may have given him for the more incidental dialogue. Halloween is hands down my favorite holiday. I’m a sucker for a good costume, and people generally have a lot more fun when they don’t look or act like themselves. I also eagerly await the end of October because of the consistently awesome Simpsons Halloween special. This year’s Halloween send-up may be the most anticipated ever, as “Treehouse of Horror XXIV” (what is this, the Superbowl?) was developed (at least in part) by none other than Guillermo del Toro, who also directed this freakin’ amazing opening sequence. Hells yeah! Hitchcock would be jealous. Oh, right, he’s in the opening. Damn, I love The Birds. Who knew they could be so creepy? At least, before we knew about avian flu. There were definitely a handful of polarizing science fiction movies released this past summer, namely Star Trek Into Darkness and Pacific Rim. While Star Trek has decreased in quality after multiple viewings, conversely Pacific Rim seems to be a much better film after watching it again and again. You fall into the world Guillermo del Toro created and marvel as its amazing imagery and spectacle dazzles you. Although the film has yet to receive a sequel greenlight from Warner Bros., its increasing box office might make the movie studio reconsider. 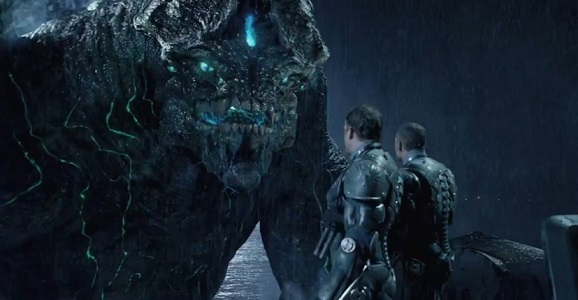 As reported on ComicBook.com, Pacific Rim is the highest grossing live-action film based on an original story or concept in 2013. Year after year, we see the worldwide box office dominated by sequels, remakes, and reboots, so it’s refreshing to see an original movie perform so well with audiences around the world. As it stands, Pacific Rim received higher grosses internationally, with $305.8 million coming from foreign markets, while domestically it took in $101.4 million, for a worldwide total of $407.2 million. 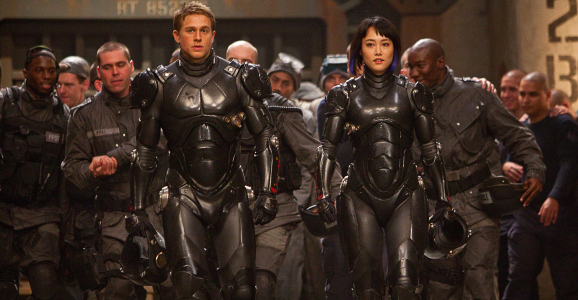 Guillermo del Toro’s Pacific Rim wasn’t the most celebrated science fiction movie of 2013. Critics gave the movie middling to lukewarm reviews, while audiences in the States generally opted not to watch it. The film wasn’t a total box office bomb, but its domestic grosses fell way short of expectations. Meanwhile, the film was a smash film overseas with countries like China, Japan, and Brazil contributing to its $406.7 million worldwide box office take. 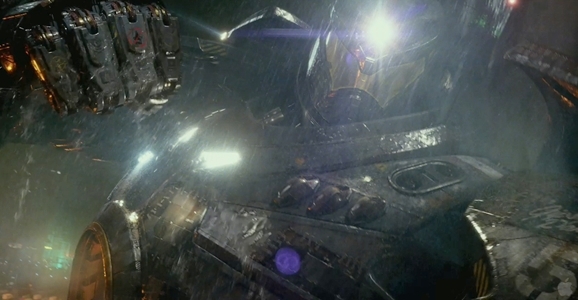 Love it or hate it, Pacific Rim is a spectacle tailor made for giant movie screens. One element that helps deliver a believable experience is the film’s amazing visual effects and art direction. Del Toro sets the film in fully realized worlds full of moving parts and a great attention to detail. The video above, which also includes over 80 fast-paced visual effects shots, showcases what went into creating giant Jaegers and Kaiju featured in Pacific Rim. The production budget was a reported $190 million, and you can see every dollar spent onscreen. No matter how you feel about the movie itself; you have to admit this is jaw-dropping stuff.